Mardi Gras, Carnival, Carnaval, Karneval . . . that’s Maslenitsa by any other name. And if you haven’t heard of it, no one would blame you—it wasn’t celebrated to much extent for 85 years in Russia. However, Maslenitsa is back in full force. Since 2002 it’s been officially organized in the city and is again becoming a mainstay of Moscow's holiday calendar. Blini are Russian pancakes, and they are essential to the celebration of Maslenitsa. Said to symbolize the sun—being warm, round, and golden—they are an appropriate warning to the lingering cold weather. Blini are given to friends and family all through the week and are topped with caviar, mushrooms, jam, sour cream, and of course, lots of butter. Group fist fights are undertaken during the week of Maslenitsa. This may sound strange to Westerners, but it's all a part of the interesting absurdity of Maslenitsa. Fist fighting commemorates Russian military history, when soldiers supposedly fought each other in hand-to-hand combat, but this fist fighting is just in good fun! Bears are still frequent sights in Moscow—unfortunately for the bears. In the past, bears and their tamers would perform at Maslenitsa, and both would be served large quantities of vodka. This ended in a wrestling match between tamer and bear, with the bear often gaining the upper hand. 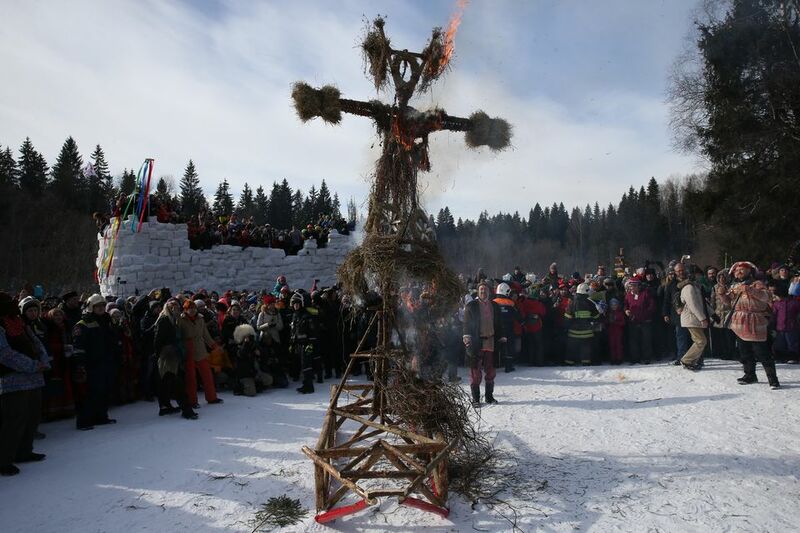 Bonfires will be lit and a straw personification of Maslenitsa may be burned during the festivities in order to say farewell to winter. Sometimes a woman from the community will be chosen to dress as Maslenitsa. Tradition says that this woman should be cheerfully thrown in a snowbank in order to complete the welcome of spring. Troika rides, sledding, theater, puppets, singing, and fireworks are all a part of the Maslenitsa celebrations. There is usually a "storming" of a snow fort. That these traditions are still alive today is a testament to Russians' long memory and preservation of their heritage. All in all, Maslenitsa is a good excuse to go out and have a good time, eat until you burst, and do something you wouldn't do any other time of the year. Maslenitsa is celebrated every year in Moscow in Vasilyevski Spusk. The Mariinsky Theater in St. Petersburg also has a playbill in honor of Maslenitsa. If you want to see how Maslenitsa was celebrated during the beginning of the century, be sure to watch the movie "The Barber of Siberia," (Sibirskiy Tsirlyunik). The plot undergoes a wonderful twist during a raucous Maslenitsa celebration in Moscow. What Is Moscow Like in September?